For unconditional love and support, there’s nothing like a dog. Some people joke that their dog is their therapist. But dogs really can be therapeutic for people suffering from anxiety and trauma. Which is why nursing homes, courthouses, and, increasingly, schools are employing comfort dogs. Scientists estimate that dogs and humans have been living together for around thirty thousand years. In this time, dogs have learned to read subtle physical and emotional cues that even fellow humans miss. When people say their dogs “listen” to them, they’re right. Dogs probably don’t understand every word we say. The average dog, Dr. Stanley Coren tells Animal Planet, has a vocabulary of around 165 human words. But they have a keen understanding of nonverbal cues like tone of voice, posture, and gaze. In addition, dogs’ legendary sense of smell enables them to detect strong emotions like fear — as well as approaching medical emergencies like low blood sugar. So if you think your dog is trying to comfort you when you’re sad — you’re probably right! Comfort dogs, or therapy dogs, provide affection to people in emotional need. Therapy dogs are not the same as assistance dogs. They aren’t trained to perform tasks. In addition, they don’t qualify as service animals under the Americans with Disabilities Act. But that doesn’t mean they don’t provide a needed and valuable service. Increasingly, schools and universities are employing comfort dogs to help students through difficult times. According to Yale researcher Molly Crossman, who studies how humans interact with dogs, there is some evidence that interacting with dogs reduces stress. Some universities keep therapy dogs on hand to help stressed-out students decompress. Schools and libraries find that reading out loud to dogs helps children to gain confidence reading. Dogs aren’t judgmental. They won’t correct your pronunciation or laugh if you make a mistake. And more and more, comfort dogs are making their way into schools. New York’s Department of Education has brought comfort dogs into 40 public schools across New York City. The dogs come from a rescue organization, which evaluates each dog, to make sure its personality is a good match for the work. A school staff member adopts the dog, and brings it to work each day. In addition, the schools receive free training on how to integrate the dog into their school counseling services. But the job of a therapy dog is more than just giving cuddles. New York City’s school comfort dogs play a structured part in conflict resolution, bereavement counseling, and crisis intervention. And in the case of school tragedies, comfort dogs are increasingly on the front lines of student support. In February of 2018, a 19-year-old gunman murdered seventeen people and injured a dozen more, at Marjory Stoneman Douglas High School in Florida. The Humane Society of Broward County and other organizations were on hand with comfort dogs the day the students returned to class. Some of these dogs came in from as far away as Illinois and Fort Collins, CO. The dogs sat in on classes, attended sports practices, and doled out much-needed love and kisses, as they welcomed the students back to school. And students, faculty, and staff were thrilled. Comfort dogs were also on hand following the Las Vegas and Orlando shootings, and the Boston Marathon bombing. They may not be trained to detect bombs or drugs, but many people would argue that therapy dogs are first responders, too. Do you think you and your dog might make a good therapy team? Or perhaps you’re interested in adopting a dog to train as a comfort dog. It’s possible, and you can do it! 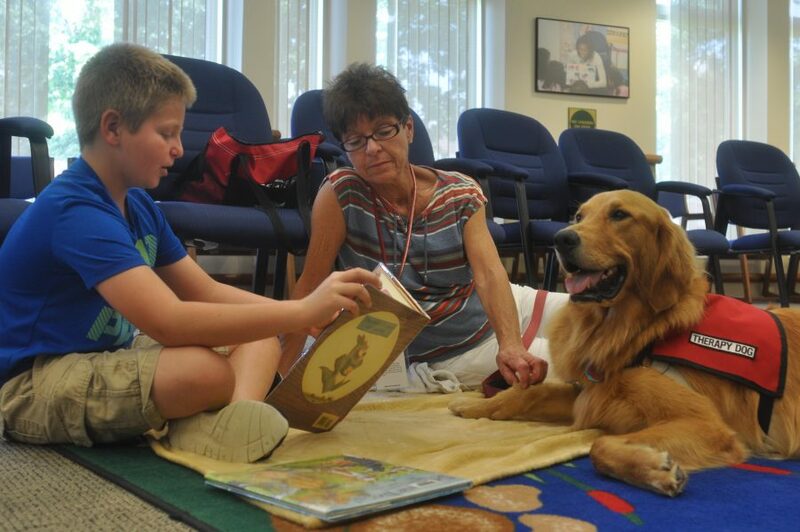 Although therapy dogs aren’t trained for specific tasks, they do need an education. First, they must have basic obedience training. A dog will be no help to anyone if it is distractible, aggressive, or out of control. The AKC Good Canine Citizen Certification is a good place to start. The Good Canine Citizen is one step beyond basic obedience training — it’s a certificate that your dog has good manners. You should also proof your dog’s behaviors. This means training and testing your dog until you’re confident that he or she will not be distracted by people, other animals, food, or other stimuli, while on the job. Finally, you should seek therapy dog certification from a respected organization like Pet Partners or Therapy Dogs International. Accrediting organizations will test you and your dog to make sure that you will be an effective therapeutic team. If you don’t think you can be involved at this level — and a lot of people can’t — consider donating to or volunteering for organizations that work with therapy dogs, such as your local Humane Society. Dogs have played a special role in human societies for thirty thousand years. Comfort dogs are the latest expression of a beautiful friendship. Featured Image is in the Public Domain, by Kaitlynn Sullivan, via the U.S. Marine Corps.